I have a little trouble explaining it, but it seems like I have periods of negativity towards my own dancing followed by growth and positivity (I think this is pretty normal). It seems like my eyes improve at spotting issues before my body is able to correct them. So my perception of the quality of what I create fluctuates wildly, not just in studio but in terms of how I remember a given performance or view my own work on video. So the blue line represents theoretical "objective improvement" (actual, physical change) that someone else would see if they watched my dancing, or that I will see if I look back at video later. 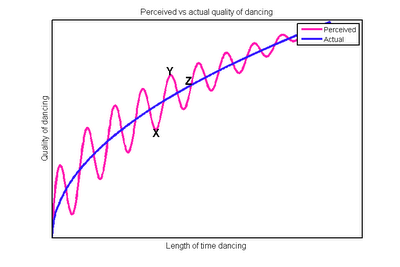 The pink line represents how good I feel my dancing is, based on the idea I have that I am able to see problems before I am able to fix them (I don't feel this is always the case, but for my purposes I'll say it often is). This causes my perception of my dancing to be very unstable. X is a low point. Like, if I have recently been noticing that my hands are out of control and I feel like my posture is flaky. My body can't immediately fix the problem (only time and work can) so I feel like all my dancing is bad. Point Y is a high point. My technique has met or exceeded my ability to pick out most problems so everything looks good to me. Basically I think I'm better than I am. Note that this discrepency is more extreme towards the beginning of my dance career, where I had less context for good and bad. And then of course, Z is equilibrium, where I see the issues and also see the improvement and quality. 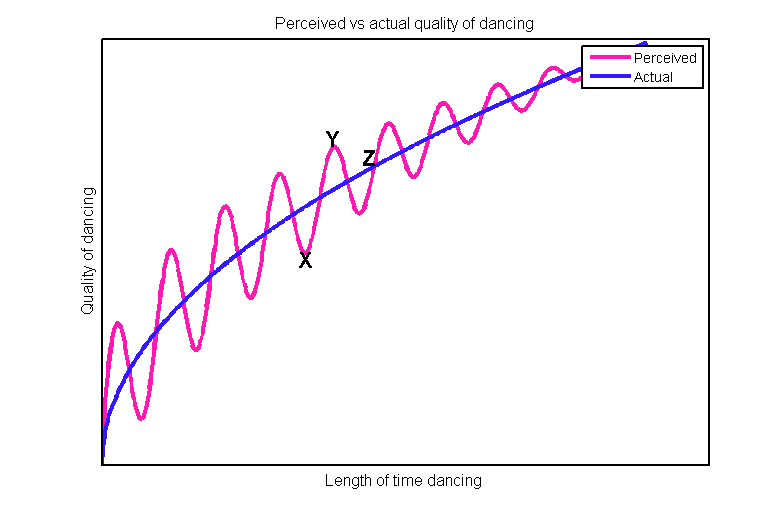 My hope is that the little sinusoidal thing happening on the graph will get smaller and smaller over time until I can see what's happening with my dancing for the most part. Not only that, but I would like for the up and down to be more critical and less emotional. I think that's the ticket. This is a really excellent way of visualizing this phenomena. Thanks Amy! I think a lot of us feel this way (not even just dancers, it can definitely apply to anything!) so I have really enjoyed exploring my feelings about this. And I was in a bit of a funk last month, and I found making a little graph about why it was pretty irrational helped so much. It's just so weird to feel like you've gotten worse when objectively that's pretty much impossible! I must admit, I got ridiculously excited at the title! Then I saw a graph, in color, and nearly had an aneurysm! :) The math nerd inside me is reeling! I have to say though, I agree wholeheartedly about this entire post. I usually feel X, in the primordial Low Left section of the graph, but I sort-of know I'm part-way up the graph at least. I think part of that issue is living in NL, as I'm sure you can relate to. It's so hard to get truly useful critique on your technique or performances. Dancing with people who have similar goals helps greatly, but there's a certain necessity to have an objective instructor pick you apart rationally instead of you (me, really) picking yourself (myself, really) apart emotionally with jagged blades. Away-workshops help, but it's not the same as weekly prodding, as it were.